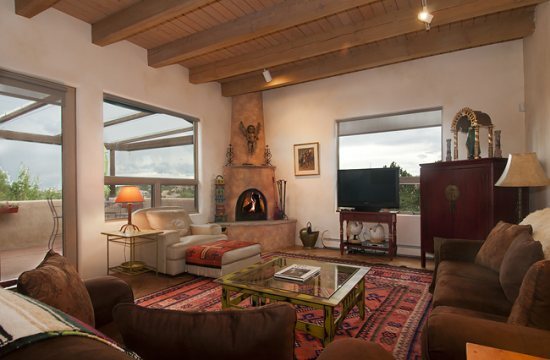 Directly north of the Plaza, this bright and contemporary Santa Fe style unit is located on a quiet cul de sac that offers a country like setting close to town. Surrounded by a green belt, this triplex affords great privacy. Enjoy the beautifully landscaped side yard or watch spectacular sunsets from the large adjacent deck with multiple awnings. 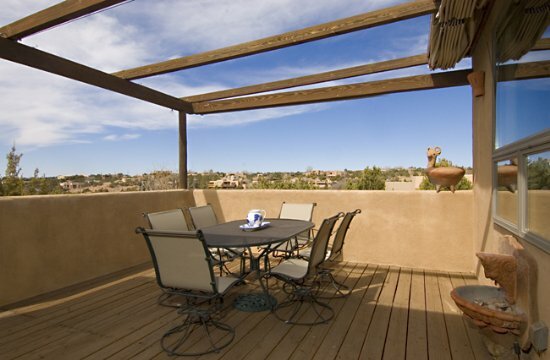 This area is a de facto outdoor dining/living room with a gas grill, outdoor furniture, dining table and bar. 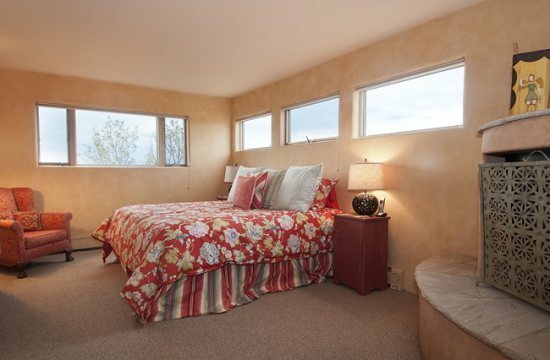 The private master suite is located upstairs and provides perfect sunrise views over the mountains. Other amenities include: fireplace, sitting room with sofa bed, bar/fridge, sink, and central evaporative cooler. Downstairs off the living/dining area are the queen and twin guestrooms with shared bathroom. The twin guest room offers a private deck. 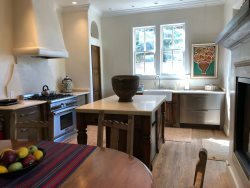 This unit is great for entertaining and cocktails before the Opera. Pets are considered on a case by case approval basis. We enjoyed the Fort Marcy park that is so close to the property. And we enjoyed being close to the plaza, although we usually drove out car to have our lawn chairs for the music on the plaza. Small pet are considered on a case to case basis, and require security deposit and management approval.